Western blot analysis of extracts from various cell lines using IRAK1 (D51G7) Rabbit mAb (Biotinylated). Streptavidin-HRP #3999 was used for detection. 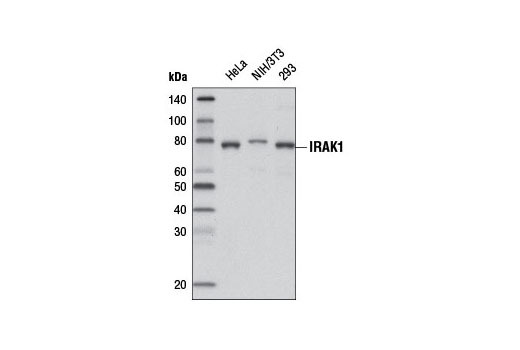 IRAK1 (D51G7) Rabbit mAb (Biotinylated) detects endogenous levels of total IRAK1 protein. Monoclonal antibody is produced by immunizing animals with a synthetic peptide corresponding to residues near the carboxy terminus of mouse IRAK1 protein. This Cell Signaling Technology antibody is conjugated to biotin under optimal conditions. The biotinylated antibody is expected to exhibit the same species cross-reactivity as the unconjugated IRAK1 (D51G7) Rabbit mAb #4504. Interleukin-1 (IL-1) receptor-associated kinase (IRAK) is a serine/threonine-specific kinase that can be coprecipitated in an IL-1-inducible manner with the IL-1 receptor (1). The mammalian family of IRAK molecules contains four members (IRAK1, IRAK2, IRAK3/IRAK-M, and IRAK4). The binding of IL-1 to IL-1 receptor type I (IL-1RI) initiates the formation of a complex that includes IL-1RI, AcP, MyD88, and IRAKs (2). IRAK undergoes autophosphorylation shortly after IL-1 stimulation. The subsequent events involve IRAK dissociation from the IL-1RI complex, its ubiquitination, and its association with two membrane-bound proteins: TAB2 and TRAF6. The resulting IRAK-TRAF6-TAB2 complex is then released into the cytoplasm where it activates protein kinase cascades, including TAK1, IKKs, and the stress-activated kinases (3). Dinarello, C.A. (1996) Blood 87, 2095-147. Takaesu, G. et al. (2001) Mol Cell Biol 21, 2475-84. Janssens, S. and Beyaert, R. (2003) Mol Cell 11, 293-302.